A small red seed that became controversial to outsiders. The current popular impression of "annatto" is that it is just a "condiment and food coloring derived from the seeds of the achiote tree native to tropical [America] from Mexico to Brazil" and the Caribbean. However, to some Tropical American Amerindians it is a part of a complex belief system in which the color red is one of the most powerful elements on the spiritual plain. Today, this color on the Amerindian skin has become a part of a hard-fought political battle and demonstrations by some Native Americans against Washington, DC's famous football franchise, the "Redskins", currently described in the dictionary as "a derogatory word". Red skin to the Amerindian was the most sacred colors of the Four Directions’ blood and the Sun’s source of life. Also annatto (a-nah-toe) 1. From the Island Carib (Kalinago) onoto. 2. Also called achiote (Nahualt, Mexico) or roucou (Tupi "urucú"). 3. The dark orange-red berries which fill the pods of this tropical American tree. 4. The dye obtained from the waxy red coating of the berries of the annatto pod used in the coloring of foods and the preparation of a cordial. 5. A low, shrubby tree cultivated extensively on both the tropical American islands of the Caribbean and on mainland South America. Redskins 1. The color ascribed to the "red race" and probably originating among Island Caribs of the Caribbean. 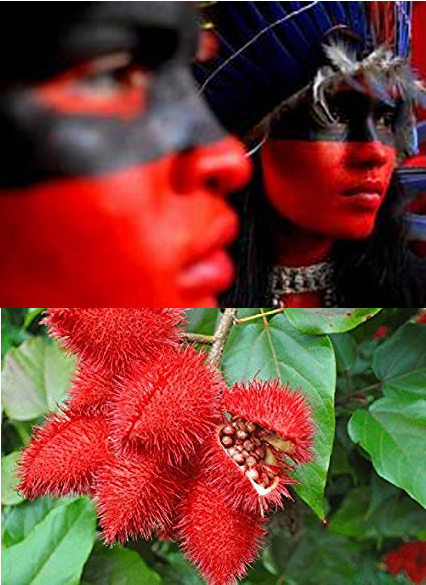 From the annatto color rubbed on the skin of Island Caribs and some Tropical American Amerindians as a sun block and insect repellent. 2. An often derogatory name similar to "Red Indians" applied to Native Americans. 3. The controversial name for a Washington, D.C. football team. 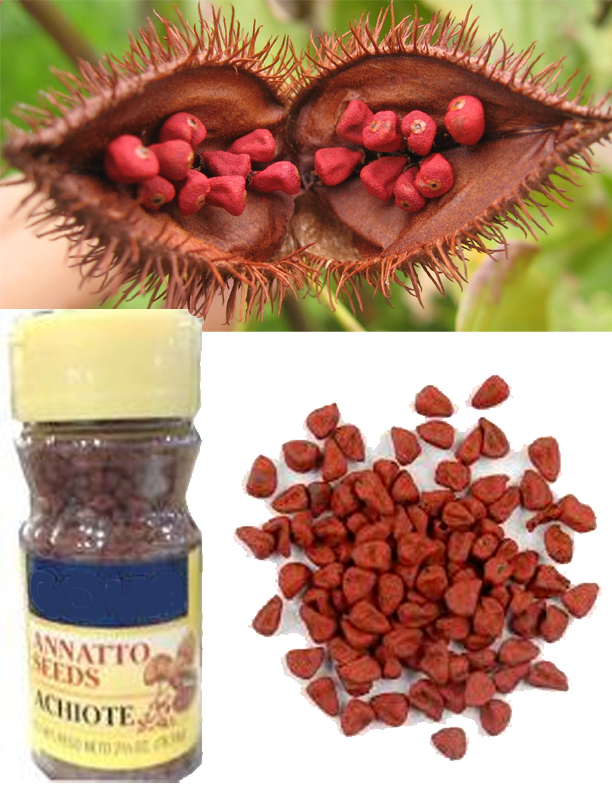 Annatto berries are found in pods which grow in clusters on a medium sized tropical American tree. The tree grows wild in the tropical forests of the mainland Americas and is cultivated in the Caribbean as a food coloring. The red pigment from the berries was rubbed on the skin of the early peoples of the Caribbean as it still is by many indigenous Amerindians in mainland rain forests. Anatto was also used in Taíno and Carib cooking and was the source of the red color used by them to "paint" their bodies. Others are of different colors." Painting the body is an ancient ritual which may satisfy social or spiritual needs. The patterns or colors used by individuals identified them as members of specific families, clans or societies. In the case of the Taíno, according to their Origin Myth, black pigment which came from the sacred genep (genapa) tree was associated with the original ancestors who arrived on to the earth’s surface from within a specific primordial cave. Red is probably the most ancient color known to humans. It represented blood and was, therefore, associated with the life force. To the Taíno it was one of the four most important colors. Red represented east, the cardinal direction from where the sun rose. The preferred ancient color, red, was also used by other indigenous Americans as body paint which caused them to be called "Red Indians" by early Europeans. Body painting also had practical biological purposes. Some indigenous North Americans used other red pigments mixed with bear geese as an insect repellent and sun block. In our contemporary societies body painting is mainly confined to the face. Face painting. Body painting may be reserved for drama. Top: Dried annatto pod. Left: Commercial jar. Note it is spelled "ANNATTO", another derivation of the word. Right: Annatto seeds. Not shown here are Annatto oil and paste. So, remember when you eat a pastry with a natural orange or yellow coloring you are partaking in an ancient ritual of the onotto's life force.